On the list of must-have gadgets for most tech enthusiasts, an air freshener might not sound like the sexiest thing out there. That’s why one Utah-based startup is attempting to make household cleanliness less of a chore, while jazzing the process up with tech-y components. Pura Scents, a smart air freshener, is a plug-in dispenser that you can control from your smartphone. The device can hold up to two scents that you can choose to alternate depending on time of day, smell intensity, and how long you’d like to leave it on for. For example, you might prefer to wake up to the smell of coffee or something citrusy, while opting to go to bed to the smell of lavender. The app can also tell you when your vial is running low so you can order refills on a subscription-based model. The idea came when Pura CEO and co-founder Richie Stapler found himself embarrassed when friends would randomly come hang out at his house, leaving him no time to clean up or mask the smell of his cooking. Home fragrances are traditionally seen as a female product, Stapler said, which is why the team created Pura Scents to give men a tech product to improve their household hygiene while allowing those who already use air fresheners a smarter way to control dispensing them. Additionally, the team hopes that by giving users more control, product won’t go to waste. “With motion-activated fresheners, if you have a cat, you’d be out of liquid in days,” the team said, noting that their device eliminates the need to use environmentally unfriendly aerosol cans. Pura estimates that each refill vial lasts between two to four months, and once the device is turned off, the smell does not linger – in case you want to switch between the two scents immediately. 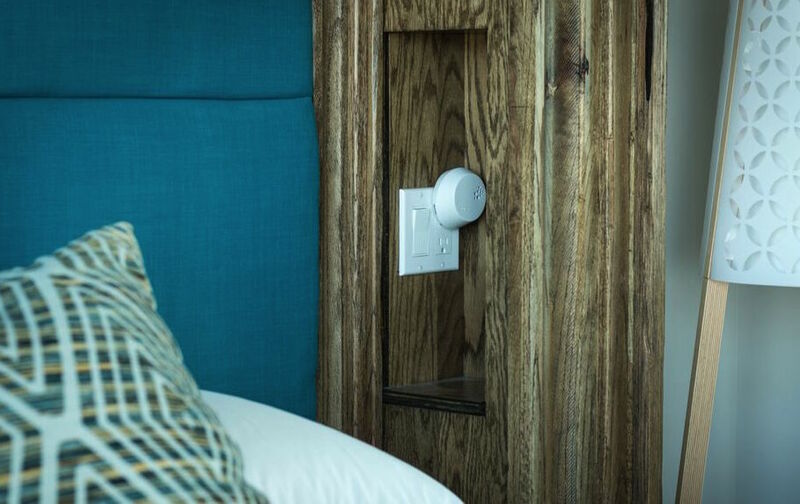 Pura Scents plugs into a regular wall outlet, and has a USB slot built in for pass-through charging. The product, which lands on Kickstarter today to gain beta testers, will also ship with a power converter for international markets. You can also adjust the light in Pura Scents to match the current fragrance being dispensed, or simply use it as a nightlight. It doesn’t have quite the romantic quality as the glow of a candle, but it is nice to be able to freshen your home without wildly Febrezing your furniture each time guests are about to arrive. The company currently has its own selections of scents, and is hoping to work with major manufacturers – such as Febreze and Glade – to offer their product in a Pura Scents-compatible vial. It’s also offering the device with an open API so users can adapt the product to work with their current smart home gadgets. Pura’s Kickstarter launches today with early backers receiving the device and two fragrances for a discounted price of $39. When the product ships in spring 2016, the retail price will jump up to $80.